The G7 met yesterday, producing a statement on Russia that threatened additional “restrictive measures” on Russia if it continued its efforts to destabilize Ukraine. The G7 (which had been the G8 until Russia’s membership was suspended at the end of March over its intervention in eastern Ukraine) appears to be at a loss for how to effectively address the situation in Ukraine. The organization appears to be divided on how to proceed, with France and Germany pushing for “dialogue and de-escalation” The current meeting had been scheduled to take place in Sochi, Russia, but was relocated to Brussels following Russia’s suspension from the organization. What do you think? Will the G7’s effort to isolate Russia be effective in changing Russia’s Ukraine policy? Does European reliance on Russia’s oil and energy production undermine the effectiveness of Western efforts to address the situation in Ukraine diplomatically? And if so, what other tools, if any, does the West have to address Russian intervention? The G7, a loose association of the world’s seven wealthiest countries, took the unusual step yesterday of backing intervention in Japanese currency markets. In the aftermath of the devastating earthquake and tsunami, the value of the Japanese yen had been pushed to record highs by markets (and currency speculators) anticipating Japanese companies repatriating funds to help rebuild lost production capacity. In hopes of keeping its currency value stable, the Japanese government injected 60 trillion yen (more than $740 billion) into the economy over a four day period following the crisis. But despite these efforts the yen climbed to its highest levels since World War II last week, peaking at 77 yen per dollar last week. So what’s the worry? Currency values are important in determining exports, imports, and balance of trade. In general, a weaker currency means more competitive exports. This is why countries sometimes risk the specter of competitive devaluation, as the United States has accused China in recent years. But in the case of the Japanese yen, the challenge is much greater. 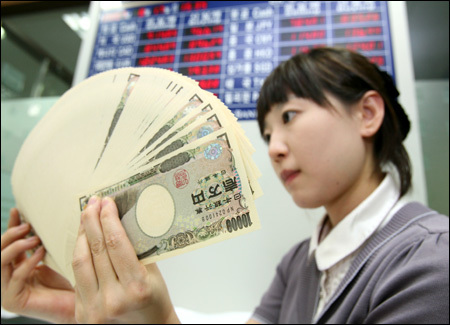 An increase in the value of the yen could weaken the Japanese economic recovery. But more importantly, there was concern that it could also hamper the rebuilding effort by sapping much needed wealth from the market. Historically, the G7 (as well as its individual member states) have been hesitant to intervene in foreign exchange markets, guided by the perception that it simply doesn’t work, or that the dangers outweigh the possible benefits. This is why the G7 maneuver is so unusual. 1. The outbreak of a new flue strain has raised concern in Mexico, as 68 people have died and more than 1,000 have been infected. The World Health Organization is monitoring the situation to determine if it is likely to reach pandemic status. While the Mexican government is urging people to remain calm, authorities have already canceled more than 500 public events and many residents in Mexico City have opted to stay home rather than travel for shopping and work. Tests have also confirmed the virus has made people in California, Texas, Kansas, and New York ill.
2. Elections in Iceland have produced the country’s first center-left government. The previous government of Iceland had been forced to resign as a result of the devastating impact of the global financial crisis on the country. Preliminary election results give Johanna Sigurdardottir’s Social Democrats 30 percent of the vote. With their coalition partner, the Left Greens’ 22 percent of the vote, the coalition appears well-positioned to drive the political agenda in Iceland. Sigurdardottir becomes the first openly gay person elected head of state in the modern world. The first item on her agenda: Icelandic membership in the European Union. 3. While the Obama administration is hoping to resume the six-party talks with North Korea, the government of North Korea appears to be taking a more hardline stance. Earlier this month it test fired a long-range missile, sparking a confrontation with the UN Security Council. Last week, the government of North Korea last week announced it would put two U.S. reporters on trial, charging them with illegal entry and “hostile acts.” Additionally, after expelling international atomic inspectors two weeks ago, North Korea has announced its intention to resume plutonium extraction. It is widely believed that North Korea already possesses enough plutonium for six to eight nuclear bombs. According to some observers, the deteriorating relations between North Korea and the West may be part of the country’s efforts to force the United States into direct, bilateral negotiations. 4. The sharp upsurge of violence in Iraq, including two suicide attacks that killed 75 people outside a Shia shrine in Baghdad on Friday, have raised concerns that Iraq is sliding back into civil war. Recent attacks raise the concern of sectarian violence, suppressed by a strong U.S. presence over the past year, but never entirely defeated. 5. Reversing a longstanding policy of the Bush administration, Secretary of State Hillary Clinton announced on Thursday that the United States would be willing to work with a Palestinian government backed by Hamas so long as the organization met international demands to renounce violence and recognize Israel’s right to exist. The Bush administration had refused to work with Hamas, which has effectively controlled the Palestinian government since it defeated its rival, Fatah, in elections in 2007. Meanwhile, Israeli Prime Minister Benjamin Netanyahu is under pressure to engage meaningfully in international diplomacy and to be seen acting. 6. The rebel Tamil Tigers in Sri Lanka on Sunday declared a unilateral ceasefire, a move almost immediately rejected by the government. An operation launched by the government last month has effectively confined the Tamil Tigers to a small enclave in the northern part of the country, and the government is expected to announce the defeat of the Tigers any day. But the United Nations has described the situation as a humanitarian disaster, with more than 6,500 civilians already killed and as many as 100,000 refugees created as a result of the fighting. 7. It was announced on Friday that China has become the world’s fifth largest holder of gold reserves, with 1,054 tones of gold. Seen as part of a broader strategy to diversify its nearly $2 trillion in foreign exchange reserves, the government of China has slowly been building its gold reserves over the several years. However, even with the recent purchases, China has a level of gold reserves (as a percent of its total reserves) far below that of the United States and other developed countries.